America's Test Kitchen, 9781940352015, 368pp. We have countless recipes at our disposal today but what are the real keepers, the ones that don’t just feed us when we’re hungry or impress our friends on Saturday night, but inspire us to get into the kitchen? 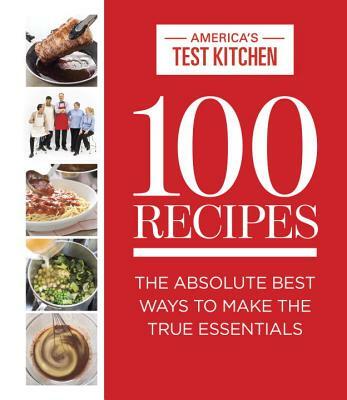 At the forefront of American cooking for more than 20 years, the editors at America’s Test Kitchen have answered this question in an essential collection of recipes that you won’t find anywhere else: 100 Recipes Everyone Should Know How to Make. Organized into three recipe sections—Absolute Essentials, Surprising Essentials, and Global Essentials—each recipe is preceded by a thought-provoking essay that positions the dish. For example, Treating Pasta Like Rice Simplifies Everything; A Covered Pot Is a Surprisingly Good Place to Roast a Chicken; and Re-imagine Pie in a Skillet to Simplify the Process. You’ll find useful workday recipes like a killer tomato sauce that’s almost as easy as opening a jar of the store-bought stuff; genius techniques for producing amazing flavor—try poaching chicken breasts over a garlic-and-soy- spiked brine (trust us, it’s that good); and familiar favorites reinvigorated—the best beef stew comes from Spain (and it’s even easier to make than the stateside stew you’ve been eating for years). Gorgeous photography (shot right in the test kitchen) accompanies every recipe, revealing the finished dish as well as highlights of its preparation. Likely to stir debate among anyone interested in food and cooking, 100 Recipes Everyone Should Know How to Make provides a snapshot of how we cook today and will galvanize even the most jaded cook to get into the kitchen.